The penultimate chapter of the five episode King's Quest by The Odd Gentlemen, Snow Place Like Home, is arriving on the 27th of September. For the past month, I've been working on some open source adventure games as part of a Game Jam that took place while the Double Fine Forums were down during an upgrade. I also just completed a new, small, one room adventure game called Dreamcat. 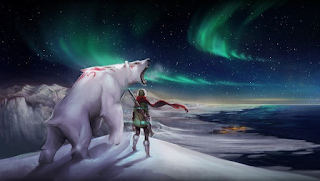 It is meant to serve as a template to make your own low resolution games using Wintermute. All of my available games can be played through the links below. Even though I ended up walking through Boston for the same amount of time on my second day as the first, I started off my final day much earlier. I woke up at 9AM and headed into Boston. After missing my turn and getting turned around, I arrived at the convention center at 11AM. I didn’t have the same luck the second day as I did the first, so I ended up having to find parking elsewhere. Now that I knew the layout of downtown Boston better, I managed to find a parking garage that advertised convention parking. Luckily it was near the hotel where the fan meetup was held the previous night, so I didn’t have any problem making my way back to the convention center. I didn’t get to go in through the exhibitor’s entrance this time, but luckily the crowd was already inside, so the line wasn’t nearly as long as it was when I arrived at the opening of the show on the first day. I spent the previous days checking out the indie games, so I decided to check out the big name games on display before heading to work. I stopped by Nintendo’s booth, and tried out the games on display. I was pleasantly surprised by Starfox Zero. From what I played, I found it really enjoyable, and didn’t notice the slowdown that many had seen. My favorite booth was the Shadow Warrior 2 booth, which was adorned with cherry blossom trees. It was really a sight to behold. I didn’t get to play the game, due to the long lines, but it looked impressive in motion. I was hoping to try out the games for the virtual reality headsets, but the waiting lines were so long there was a list that was filled up ahead of time, so that was out. Since the Shadow Warrior 2 display was so close to the Double Fine booth, I decided to see if anyone wanted me to take over so that they could take a break. My offer was gladly accepted, so I took the tablet that was being used for credit card transactions and settled in for my last day helping out at the show. The large T-shirts were mostly sold out by the time I arrived, and the Brutal Legend art books sold out before the show closed. Gang Beasts continued to be a crowd-attracter, and more Everything also brought in its share of people to marvel in its charming weirdness. The time seemed to fly by, and before I knew it, it was 5:30 and we began counting down the clock. Of course, the last thirty minutes seemed to crawl. It always works that way when you are paying attention to the time. I decided to help the team pack up before they headed out, as they had an early morning the next day, since their flight back to California left at 6AM. I bid the team farewell, and told Spaff that I was available to help out again if they ever came back to PAX East in the future. I did get lost on the way back, as to be expected, but thankfully I was close this time. I asked for help on my previous days, but their advice just ended up in me going around in circles. This time, the parking garage was right down the street, so I was able to easily find my way to it from the directions I was given. I was going to head directly back to New York, but I was tired so I opted to spend an extra day and a half relaxing before I headed home. All in all, the experience was fun, despite my knack of getting lost. I got to check out some games that I was anticipating, got to meet some of my gaming heroes, as well as people that I had only known online through fan websites and in my time as a community manager. Best of all, I got to help one of my favorite companies, and I have a lot of fond memories and pictures to remember from my experience. If the opportunity to do something like this came up to do this again in the future, I’d take it in a heart beat. I ended up sleeping in the second day, probably due to all the walking around Boston I did while I was looking for the parking garage, and ended up waking up at 10:30. I headed to McDonald's to get myself a cheap breakfast before I headed into Boston, and ended up arriving at the convention center at noon. This time, I ended up getting lucky in terms of parking. While the convention center sign usually stated that the parking lot was full, this time I was pleased to see that parking was available. I headed to the parking lot and paid the attendant fifteen dollars. However, I still had to circle around a few times before someone pulled out of their parking space. The bonus of being able to park right next to the building was, with my exhibitor's badge, I could enter the exhibitor's entrance and walk through the staff corridor. This brought me right to the show floor. I headed to the Double Fine booth, and went right to work, operating the credit card system for the store. It seems that Saturday was a good day for sales, as the Psychonauts mini action figures were completely sold out. While working the booth, two people came up who were cosplaying Double Fine characters - one as Raz and one as Manny Calavera. Sadly, since I was working, I left the camera in the staff tent area, but it was still enjoyable to see. The pinny arcade pins again continued to sell quite well, as we continued to restock them in the display area in front of the booth. I personally enjoyed selling the Raz and Hexipal plushies, as the people who bought them were always so pleased once they were given them. They are cute, and they are really well made. I have one of each, which are currently sitting happily in my living room. This time around, since I arrived late, I continued working at the booth right up until the close of the exhibition hall. Spaff reminded me that they were holding a meet-up with Media Molecule and friends at the Renaissance Boston Waterfront Hotel immediately after the exhibition hall closed. It was right down the street, so I thought I'd be saved the amount of walking from the day before. I should have known to not sell my knack for getting lost and confused short though, as I ended up walking for another three hours until I made my way to the hotel. When I did make it though, I had a great time. It was great to meet up with the group, talk about games (mostly about Miitomo on my part, as I was a bit addicted to it when it first launched), and enjoy the great seafood New England has to offer. I'm not much of a drinker, so I ordered a lemonade, tried an oyster, and ordered a fantastic lobster roll. Since I got there so late, most of the group left shortly after I arrived. Once I had finished my meal, I decided to head back to the convention center. As I was at the convention center anyway, I decided that I'd check out what PAX East had to offer after the exhibition hall had closed. The day before I was talking to Ron Gilbert about the difference between E3 and Pax. He said that he liked PAX better because it felt more fan-oriented, and wasn't as loud. I thought that, even though it was as big as E3, it had the some of the vibe of smaller gaming shows like Magfest or the Midwest Gaming Classic. This feeling was increased tenfold once I got a taste of the show after exhibition hours. It had rooms dedicated to multiplayer gaming, both on consoles and on PCs. There were also people playing card based role-playing games, arcade games, and rooms full of games running on classic video game consoles, from the 8-bit era to the original X-Box and PlayStation 2. I had always enjoyed classic game shows, so I enjoyed checking everything out. This portion of PAX East closed at midnight, so at 11:45, I headed out to the parking lot (after getting directions from one of the PAX staff). At this point the parking lot was fairly empty, so my car was only one in about a dozen, making it easy to find. I then headed out of Boston, which was an easy task at this hour, as traffic was minimal, so I could get some sleep for the last day of the show. The third film in the Back to the Future trilogy contains a lot of backstory for the game, so even though it doesn't include as many of the rules of the Back to the Universe as its immediate predecessor, it's still important to understand how this film works as well. Like the second film, Back to the Future Part III begins immediately where the last film left off. Doc had sealed the DeLorean up in a cave, written Marty a note informing him that he is working as a blacksmith in 1885, and left it with the post office to be delivered 70 years into the future. Marty enlists the help of the Doc from 1955, as the DeLorean from the cave is in bad condition and needs to be fixed with 1955 parts. However, Doc notes that the hover equipment is damaged beyond repair and the DeLorean will probably never fly again. Upon reaching the location, they find Doc's tombstone in the cemetery and are surprised to learn that the date of his death is only one week after he sent Marty the letter. They go to the library and find a history book that proves that has a picture of Doc, taken in front of the clock of the clock tower, before it was finished being built, in 1885. 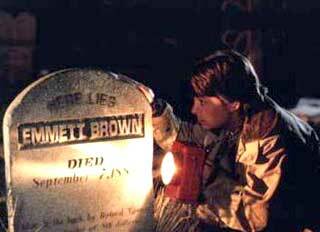 They take a picture of the tombstone, which states that Doc was "shot in the back by Buford Tannen over a matter of 80 dollars". It also states that the tombstone was placed by Doc's "beloved Clara". Both of them have no idea who Clara is, but ultimately decide to proceed with the plan set up by the Doc from 1985, with one alteration. 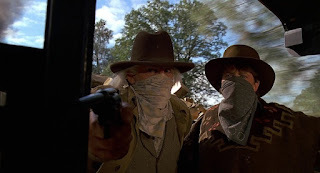 The younger Doc and Marty decide to go against the wishes of the older Doc, who wanted Marty to go directly back to 1985 and leave him in the Old West. Marty instead intends to use the DeLorean to travel back to 1885 to bring Doc back home. Doc gives Marty his second silly disguise, and he takes the DeLorean time machine back to the old west. Of course, things don't work out as planned. Upon arriving in 1885, the DeLorean winds up in the front of a group of Native Americans who are being chased by the United States Cavalry. 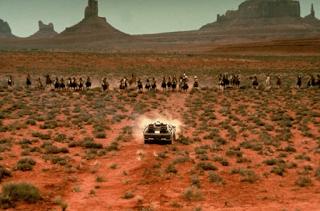 Marty ends up driving the DeLorean into a cave before the Native Americans or the Cavalry can notice where he ended up. He finds that the gas line is leaking due to a strike by an arrow, but before he can attempt to fix it, he's chased out of the cave by a bear. Marty hits his head and is found by his great, great grandparents. Upon entering town Marty takes the name of "Clint Eastwood", and then proceeds to embarrass Buford "Mad Dog" Tannen, who chases Marty with his gang, catches him, and strings him up on a noose to hang him. Marty is rescued by Doc, who shoots the rope from which Marty is hanging with a homemade sniper rifle. Buford informs Doc that he owes him eighty dollars for a horse that he shot after the horse lost a shoe that Doc had put on the horse. Doc refuses to pay as Buford never paid to have the shoes put on the horse in the first place. Marty then informs Doc that he will be killed by Buford in a week due to the fact that Doc didn't pay him the money. Doc also learns of the damage to the time machine, but Marty seems unfazed as he is under the mistaken impression that the Mr. Fusion nuclear reactor that Doc used to convert garbage to energy can be used to power the DeLorean. 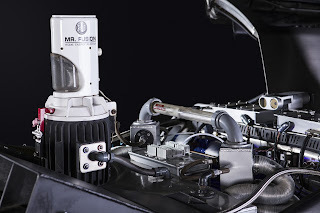 Doc corrects Marty, as he explains that the Mr. Fusion is only used to power the fusion generator of the time circuits in place of the plutonium that it previously used. The DeLorean itself still uses a standard combustion engine to run and needs gasoline in order to function. Several test runs of ideas ranging from using alcohol to fuel the DeLorean, to pulling the DeLorean with horses, fail. Doc then decides to instead use a steam locomotive to push the DeLorean up to eighty-eight miles per hour. 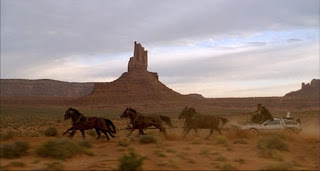 They learn that a train will be coming by the morning that Doc is supposed to die and decide that, although it is cutting it close, they should be able to make it if they head right to the train and avoid Buford. However, Doc and Marty soon find a woman whose horses have been spooked by a snake and is about to head into the ravine. Doc saves her and discovers that she is Clara Clayton, a school teacher. They fall in love at first sight, which Doc had originally passed off as an impossibility for his scientifically oriented mind. Marty tells Doc that the ravine is known in 1985 Clayton ravine. It was renamed from Shonash ravine after a teacher fell into it and died one hundred years earlier. Doc realizes that Clara was meant to die in that ravine, and is concerned that he had changed history. In the previous timeline, before Marty went back to get Doc, Doc had volunteered to pick Clara up at the station. That gave them a week to get to know each other and led to Clara making the epitaph on Doc's grave when he died. In this timeline, however, Marty's appearance caused Doc to forget to pick her up, which led to the snakes spooking the horses as they did before Doc traveled to 1885. However, Doc rescued her, leading them to fall in love as they had in the timeline before Marty arrived. Clara tells Doc that she hopes that she'll see him at the Hill Valley Festival. 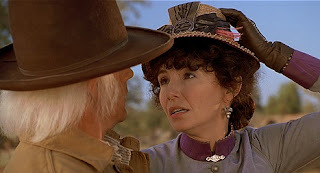 Doc states that she will, and both he, and Marty, as "Clint Eastwood", attend the festival. While there, Mad Dog Tannen smuggles in a gun, which has only one small bullet that is said to take a week for the injuries to kill a man. Doc realizes that this is where he died, so he purposely keeps facing Tannen. As Mad Dog is about to shoot Doc, Marty uses a Frisbee brand pie tin to knock the gun out of his hand, causing the bullet to merely graze Doc's hat. Mad Dog calls Marty "yellow", which gets at his weakness, which is to never allow anyone to call him chicken. He agrees to a duel on the day of the train's arrival, assuming that they will be out of there by then. However, Doc points out that it is possible that the train might be late. 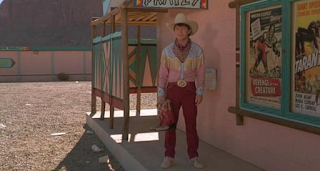 Marty's great-grandfather is disappointed in "Clint", and tells him the story of his brother Martin who was killed by a stabbing because he would always do foolish things simply because someone called him a coward. 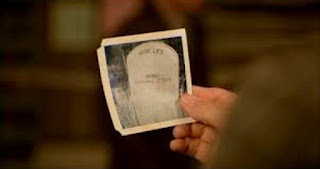 Later, Marty points out that the picture of the tombstone no longer states that Doc died, so he assumes that their plan will work. However, Doc points out that if the future was already written, it doesn't make sense for the tombstone and the date of the death, as well as for the picture itself, to still exist. 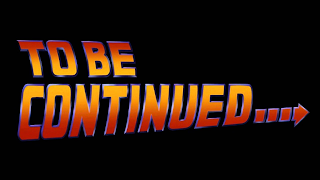 Doc tells Marty that the future still is being written, and it is still possible that Marty will be the one to be killed on that day. Doc and Clara fall even more in love when it is revealed that they both share a love of science, with him being a scientist and student of all sciences, and her loving science since her father gave her a telescope as a child. They both also love Jules Verne novels, as his words were what inspired both of them to be interested in the pursuit of scientific knowledge. Doc decides that he wants to take Clara with them, so he tries to tell her the truth. She thinks that he is abusing her love of Jules Verne to make lies to break up with him, and tells Emmett that she never wants to see him again. 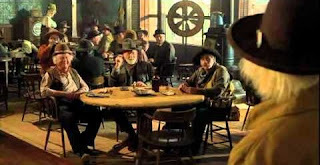 Doc gets depressed from his heartbreak and goes to the saloon to pour his heart out. The patrons at the bar find his stories of the future humorous, and when Marty arrives, on the day of the duel, he thinks that Doc is drunk. Marty convinces Doc that they need to go, and Doc drinks the whiskey in front of him. He then passes out. The bartender tells Marty he only had one drink and is known for not being able to hold his liquor. The bartender gives Doc a drink to make him sober, and everyone waits for Doc to wake up. 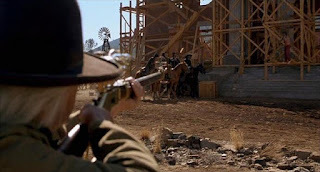 Marty then hears Mad Dog Tannen outside and discovers that it is now "Clint Eastwood" who is stated on the photograph to die. He tries to sneak out the back, but Doc, who had awoken from his drunken sleep, is captured by Mad Dog. 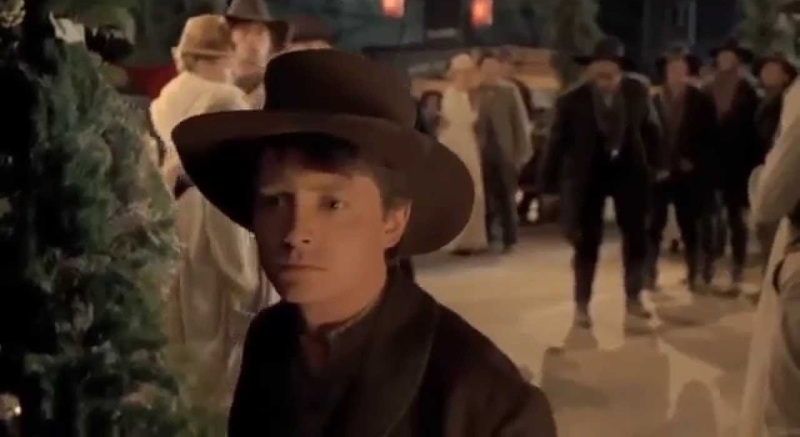 Doc tries to get Marty to leave and save himself, but Marty can't leave his friend behind. 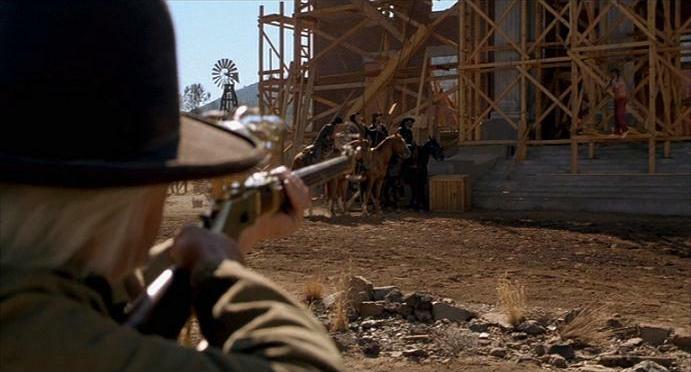 Marty goes out to face Mad Dog but drops his gun telling him that he won't fight. Mad Dog then proceeds to shoot him and cockily walks up to what he thinks is "Clint's" dead body. 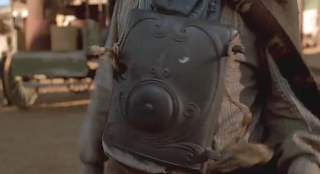 However, Marty had taken a door from a stove, and used it as a make shift bullet proof vest, as he had seen in a Clint Eastwood film shown at Biff's Pleasure Paradise in Back to the Future Part II. Marty then knocks Mad Dog Tannen out, and the lawmen proceed to arrest Tannen and his gang. At this point, the picture now just shows grass, which means that the future hasn't yet been completely written (possibly indicating that Doc plants the tombstone at some point in order to make sure that Marty arrives in the past to prevent a paradox). Wearing bandanas over their mouths like outlaws, Marty and Doc hold up the train and claim that it is a science experiment. 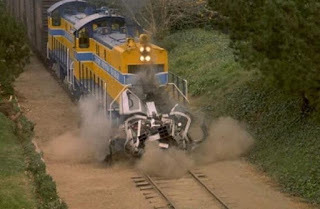 They disconnect the engine from the other cars and drive it up to the DeLorean, which is already on the unused portion of the tracks. Doc has prepared his own type of presto logs, which are color coded to get hotter and make the train go faster once it reaches certain speeds. Marty is in the DeLorean from the start, and Doc plans on catching up once the logs reach a certain level. However, Clara, who learned that Doc was torn up about their breakup, and discovered Doc's model DeLorean time machine in his workshop, had jumped from her horse to the moving train. Doc is just moving to the DeLorean when he hears the whistle blow. He sees Clara and goes back to rescue her. 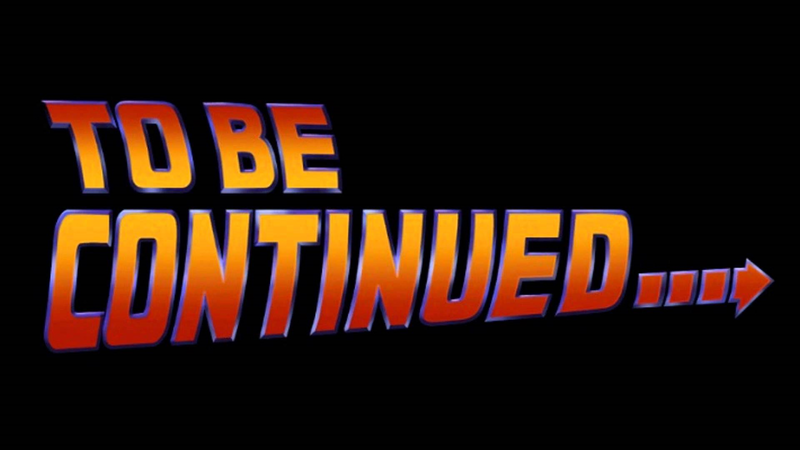 However, at this point, the DeLorean has passed the point of no return, and it's too late. Marty slides the hoverboard back to Doc, and he safely glides away with Clara in his arms. 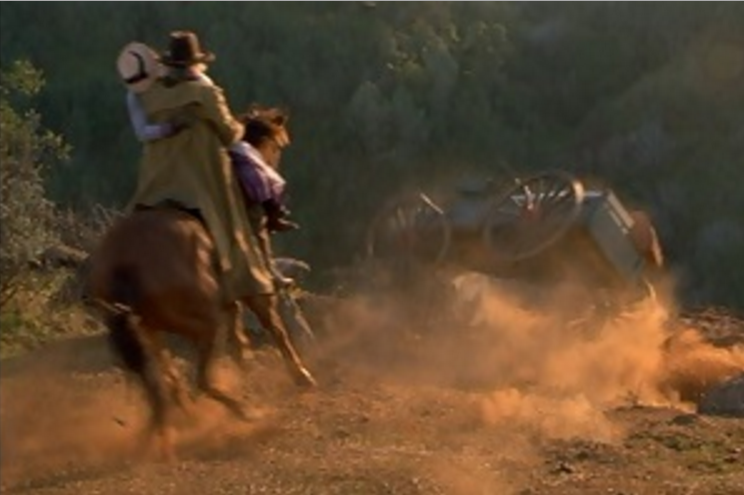 Marty then successfully goes back to 1985, as the train in 1885 crashes in the ravine. The DeLorean crosses the now completed bridge across the ravine, which is now named "Eastwood Ravine". Marty hears a train whistle and jumps out of the DeLorean just before the collision. However, the DeLorean is broken into pieces by the train. Marty states that Doc has gotten his wish, as the DeLorean has been destroyed. Marty then goes and gets Jennifer, who at first thinks that everything was a crazy dream. However, once they reach Marty's classmate Douglas Needles, he tries to coax Marty into drag racing him by calling him chicken. Marty then pretends to comply, but backs up, as, after the advice given by his great, great grandfather, he has learned to not be intimidated by bullies any longer. 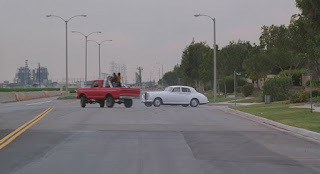 Marty sees Needles narrowly miss a Rolls-Royce and realizes that he would have hit it. Jennifer then realizes that it wasn't a dream and pulls out the fax she took in the future. She sees the message that Marty has been fired become faded until it is erased. Marty and Jennifer go to the train track to look at the wreckage of the DeLorean, and they become sad that they will never see Doc again. 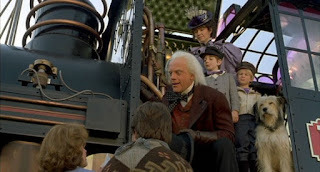 At that moment, Doc appears in a steam-powered time train. He and Clara now have young sons, Jules and Verne. Doc had previously come back to the 1980s to pick up Einstein and had traveled to the 2010s to have the train hover converted. Doc and his family then leave to the past, and the original trilogy comes to a close. 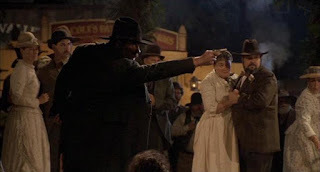 However, the story is continued in Back to the Future: The Game, which takes place six months after Doc leaves Jennifer and Marty in 1985 in his time train. The story is certainly a fun one, but it takes its cues from the second film in terms of confusing moments. But first, we'll take a detour towards IDW's comics, as they explain a lot of mysteries from the films. Kathy Rain tells the compelling story of a strong-willed college girl with a knack for detective work (and a Harley) who returns to her hometown after being gone since childhood. Set in the 90’s, Kathy starts investigating a local mystery and the legacy of her recently deceased grandfather. As she follows a trail of clues he left behind, questions emerge… What was Joseph Rain really looking for that night all those years ago? What turned him into a mere shell of a man, confined to a wheelchair? What secret did a suicidal young artist take with her to the grave, and why are so many people in Conwell Springs going mad? The truth is dark and sinister. The game is due out for Windows and Mac on the fifth of May. You can pre-order it at a 10% pre-order discount from GOG.com, Steam, or Humble Bundle. I'm back from PAX East. I'll post about my experience at the show in a bit, but for now, I'll catch up on some of the releases that have happened lately. The Walking Dead: Michonne, the miniseries by Telltale Games that reveals what happened to the character of Michonne during the period when she left the group in the comics after the events of All Out War, is now complete, with yesterday's release of episode 3. Also receiving its third episode yesterday was King's Quest, the official ninth game in the series, by The Odd Gentlemen. This episode, Once Upon A Climb, tells the story of how Graham saved his future wife Valanice, who is also Gwyndolyn's grandmother. Double Fine will be coming to PAX East this weekend. They'll be at booth #6123 showing off Day of the Tentacle Remastered and Headlander. 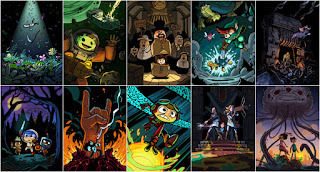 They'll also have three Double Fine Presents titles, Gnog, Gang Beasts, and Everything. A new title will be shown at the show as well. They'll also be selling merchandise at the show, including the Raz and Two Headed Baby Pinny Arcade pins, and a new special edition game bundle box. The bundle contains 10 games, with 10 game cards drawn Jon Magram and Melissa King. The game cards can be seen below (click to see them in a larger size). Telltale has been using Minecraft: Story Mode to try out new ideas, and the pacing of the series is no exception. There is still one more episode to go in the season pass, but with this episode the Wither Storm story line is wrapped up in a satisfying, yet emotional conclusion. As the episode begins, Jesse's gang and the Order of the Stone are both dealing with the effects of the events of the last episode. Everyone has to team up with an unlikely ally, and in the process Jesse learns more about the Order than anyone had before, outside of the Order themselves. The previous episode broke out of the mold of the traditional losers turned heroes story line, but this episode completely turns expectations on its head. The story of this series has never been presented better than it is here. Thankfully, the game play also manages to live up to the standards of the story. There are some interesting puzzles, and the action sequences are quite memorable. There are also some choices and consequences here that make a noticeable difference in the final moments of the game. There are quick time events, of course, bur as with the rest of the episodes in this season, they are balanced by the excellent hit counter based directly controlled combat system. The only drawback in the game play is a maze half-way through the episode, which is not puzzle based, but trial and error based. It's a small maze, and it doesn't last long, but it's a shame that they didn't use a puzzle to solve the maze, as they showed they can do it well in Tales of Monkey Island. As it stands, the maze just feels like a way to artificially extend the play time. The presentation is once again excellent as well. The new locations are quite interesting, and as usual the blocky graphic style fits the retro 1980s feel that was the inspiration for the story. The music once again also manages to capture that feeling fantastically. The voice actors are also on the top of their game in this episode. As this is the conclusion to the storyline, we get to see more of characters that haven't appeared much in the season. These characters stand right up against the main cast, which is a testament to the skill of the voice actors. Some of them even get their personalities and backstories more fleshed out in this story, which also helps the game not feel as one-dimensional as it did in early episodes. This may be a family friendly story, but as Wallace & Gromit's Grand Adventures showed previously, Telltale can still deliver a fantastic story and interesting characters in a family friendly environment. The fourth episode of Minecraft: Story Mode is a surprise early ending to the Wither Storm story line, but it is handled quite well. The story is the best in the season, delivering plenty of surprises, and fleshing out characters, giving the whole game more depth than was evident early in the season. There are also some choices and consequences that have a noticeable effect in the story. The music, puzzles, and art style all continue to shine, and the voice actors give some of their best performances to date. The only drawback is a maze that feels like it is there just to artificially extend the play time. Thankfully though, the maze is a short one, so it doesn't detract from the rest of the game, which is fantastic. 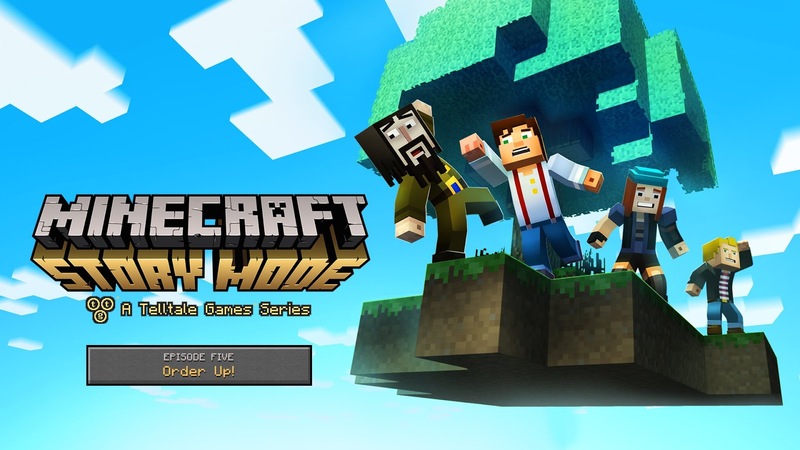 Telltale has used Minecraft: Story Mode as a testing ground for new ideas, and they have succeeded. It's certainly their most diverse game in the modern era, and possibly the most diverse game they've ever made. It's well worth experiencing the story of Jesse's group and the Order of the Stone.